I love it when this happens: someone very wise states a basic truth in a simple and elegant way and I hear it anew. I’ve known about this mirror thing for many years. The things we like or dislike about others serve as a mirror for those things we like or dislike about ourselves. The judgments we have of others are really self-criticisms. It all make sense, yet Brown’s message gave me a tool to go beyond self-awareness – to transformation. And, it’s important because without the process she outlines, looking in the mirror just produces more self-criticism. Like every great tool, her process lends itself to interpretation. I’ll share mine here, in the hope it will be practical and useful to you too, spirited women. Examine the judgment. Ask yourself: “In what way does this behavior I’m judging in someone else remind me of something I don’t like about myself?” This step requires introspection. Don’t rationalize it – seek the insight, even if it seems illogical. Give yourself a break. Practice self-compassion. Forgive yourself. This is the most important step, and it’s easier because you have company. Then, (are you ready for this?) – feel empathy for the person you were judging. That’s easy too, if you acknowledge the ways in which you thought or acted in similarly. Compassion for the other person becomes automatic because – and perhaps only because – you just felt genuine compassion for yourself. This new insight doesn’t change the inevitable fact that judgments will arise in me. It doesn’t change the need to practice self-acceptance. But in the week or so I’ve been focusing on this, I’ve transformed quite a few criticisms of myself and others – things that were sitting below the surface affecting my quality of life in some small way. Brown says the practice will bring more joy. I welcome that. How about you? “How are you?” My Pilates instructor, Dana, asked. “I’m angry with my body,” I replied. For five years I’ve been dedicated to a somewhat unconventional practice for managing the issue of my back. I’ve been committed, using a combination of prescribed stretches, Pilates and other exercises that have quite literally changed my life. Before finding this process, I had poor posture, bad sitting, standing and walking habits, and always had at least some pain. Lately I’ve been slipping. I’ve been busy, traveling a lot and not making the time I know I need to dedicate to this practice. After stating that I was angry, I went on to complain about how little time I had and how frustrated I was that maintaining the healthy state I had achieved still took so much work. Why couldn’t I have just been born with an easy body that didn’t require so much maintenance? I picked the wrong person to whine to, at least if I was looking for sympathy. Dana knows me well. She asked me to consider that perhaps not making time for the exercise that improves my quality of life might just be an indication that I wasn’t making the time to care for myself. She was right, and I knew what I had to do. But I left there that day still angry with my body. I went home with resolve to repair my current ache through diligently practicing my exercises. As I lay on the floor stretching my right hamstring, I suddenly thought, “This is silly. How could I be angry with my body?” It’s just a body, not a being with conscious intent. That would be like feeling anger at my car because it wouldn’t start. I know I’m not my body. My body is a vehicle I manage, and it was me I was angry with; angry for not making the time to care for myself in a way that’s loving and forgiving of its physical flaws. Still, I had judgment. Self-judgment that here I am, writing as I often do that a loving and kind relationship with ourselves is a prerequisite for the same with others, and not walking the talk. 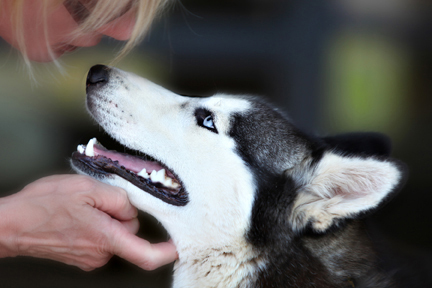 That night, one of the huskies helped me see the lesson, and helped me take a gentler stance. While making dinner, I accidentally stepped on Heather’s paw. She jumped, began to slightly bare her teeth, and then softened. I embraced her, and she cuddled into my arms. In the five months she’s been with us, she has been working to outgrow a fear response to pain from the abuse she suffered. I was struck by her progress as I recalled the first weeks with her. I saw it as just a residual shadow, but indicative of a long process of letting go of what appears like a reflex response. At once, I knew the same was true for me. When life gets busy and demands for my time are heightened, I can forget to take care of myself. It’s a reflex response like Heather’s. And like hers, it’s dissipating over time. Like hers, it responds best to love and kindness. I feel qualified to repeat the advice I’ve offered before. Care for yourself. You’re the only self you’ve got.